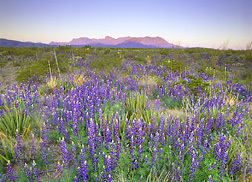 Early Spring at Big Bend National Park can be extraordinarily beautiful. 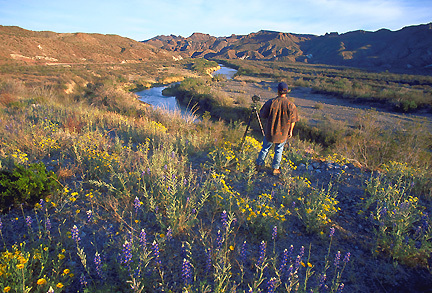 Sometimes, when the conditions are right the park transforms itself from a hot, arid, brush covered desert, into a lush, cool oasis of unbelievable beauty and diversity. 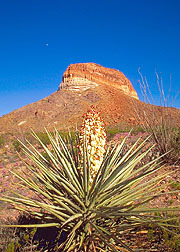 It was 2:00 am, I just drove 10 hours straight from Houston to Big Bend National Park. 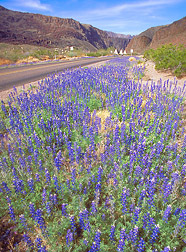 The last 70 miles from Marathon to the park headquarters are always the hardest and I was feeling pretty tired, so when I first noticed a few clumps of strange looking blue plants on the side of the road I hardly noticed, but soon those small clumps turned into large clusters, those large clusters turned into enormous clusters. 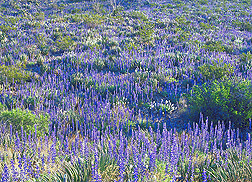 A smile appeared when I first came to the realization that all those blue plants were actually Big Bend bluebonnets. Mile after mile all I could see was the road directly ahead of me and huge, massive stands of Big Bend bluebonnets lining both sides of the road. Finally, I had to stop. Standing there in the middle of a night under a blanket of stars, waist deep in big beautiful flowers was truly amazing. It was about 3:00 am when I reached Panther Junction visitor center, I pulled into the parking lot and tried to sleep but was to excited, I just couldn't stop thinking about all the photographic possibilities. So, I decided to drive the extra 60 miles to the area around Castellan Peak, if nothing else I could use the incredible rock formations as silhouettes set against the approaching sunrise and maybe try some early morning light painting. Of course I wasn't sure if there would be any flowers on that side of the park but I knew that I could always return to Panther Junction later that afternoon or the next day. After driving for thirty minutes or so, there wasn't a flower in sight and I was starting to wonder if I made the right decision. But I was determined and continued on. The road after you reach Sotol Vista overlook becomes very steep and somewhat dangerous, after 15 minutes of intense driving the road finally levels out and I was able to relax a little, but still no sign of any flowers. 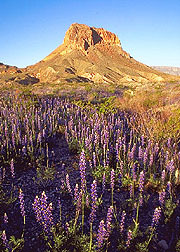 I was approaching the turn off to the Mule Ears trail when I noticed the first group of bluebonnets, not a lot but at least there were some. 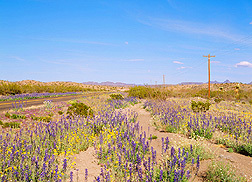 A few miles later more started to appear, then more and more until the roadsides were once again covered with those amazing blue flowers. By the time I reached Castellan Peak they were everywhere. Not just bluebonnets but the Yucca were also blooming, although it was still early in the season for most of the prickly pear there were a few early bloomers and one in particular caught my eye. 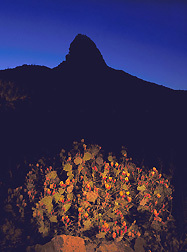 It was situated just below the massive rock formation called Castellan Peak. I knew it would be a perfect subject for a light painting photo. First light had just appeared to the east as I was setting up my equipment, I quickly composed, then opened the shutter using a cable release and the bulb setting on my Pentax 645 camera. Using a powerful Maglite flashlight with a warming filter taped over the front, I started painting the prickly pear, slowly moving the light from one side to the other, at a slight angle to create shadows and give the image some depth. After approximately five minutes I turned off the flashlight but left the shutter open for another 5 minutes to capture the soft light of the coming sunrise. Afterward, I loaded my gear into the car and drove around to the east of Castellan. I knew there were bluebonnets along the road but it was still to dark to tell if there would be any flowers other than that. When the light was finally bright enough I was amazed by what I saw. I was completely in shock. There were massive stands of bluebonnets hundreds of yards deep in all directions. 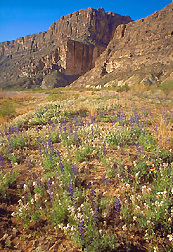 Imagine the creek beds around Santa Elena Canyon covered in huge stands of multicolored wildflowers, Cerro Castellan surrounded by hundreds and hundreds of blooming prickly pear and giant yucca, the north facing hills east of Dugout Wells saturated with layer upon layer of Big Bend bluebonnets and fluorescent marigolds. 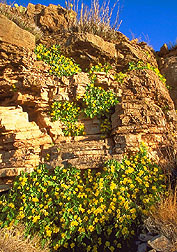 The upper cliffs along the road to Rio Grande village painted brilliant gold and yellow with thick pockets of rock nettle. That morning was truly an incredible photographic experience, and each day just kept getting better and better!